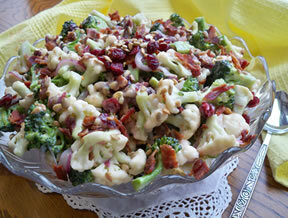 Fresh and creamy vegetable salad with the smoky flavor of the added bacon. 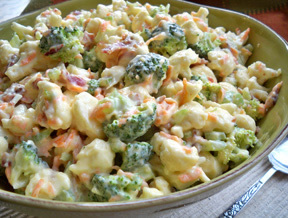 This is perfect to bring to any potluck or picnic. 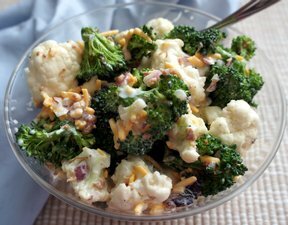 In a large bowl, mix the broccoli, cauliflower, bacon, cheese and onion. 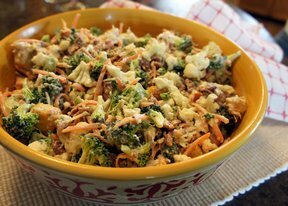 For the dressing, whisk together the sugar, vinegar and salad dressing. Pour dressing over the vegetables and stir to coat. Chill for at least 2 hours. "I brought this to a summer picnic and didn't have any leftover. The only change is I used mayonnaise instead of salad dressing. Still delicious!"